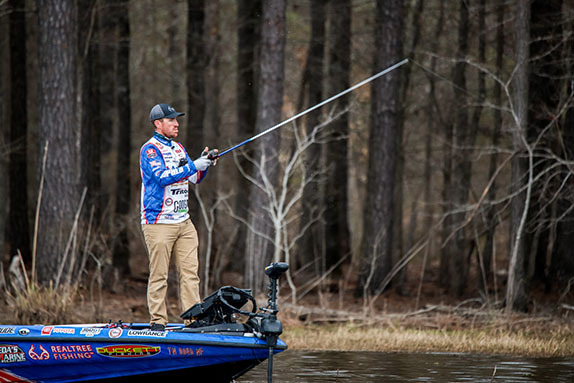 A huge third period propelled Jacob Powroznik to victory at Shearon Harris Reservoir. Two guys with the same first name each had a dominant period on Shearon Harris Reservoir during the Championship Round of the MLF Bass Pro Tour event in Raleigh, N.C. In the end, the one throwing a wacky-rigged worm slightly outperformed the one slinging a frog imitation on a small power-plant lake teeming with big bass that are either on the spawning beds or will be very soon. Jacob Powroznik, who lives less than a two-hour drive from Shearon Harris and had fished the lake perhaps a dozen times previously, caught 20 fish for 63-04 to edge Jacob Wheeler for the win. 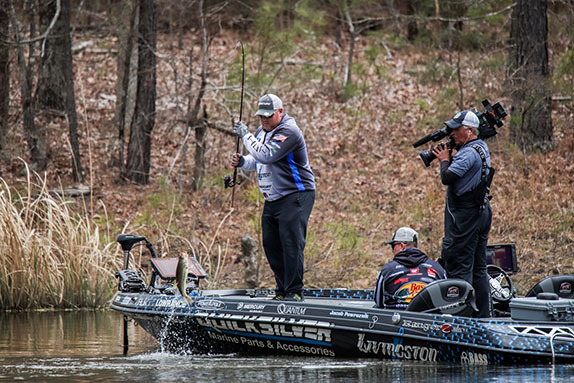 Wheeler concluded with 59-10 on 15 fish en route to his second runner-up finish in three weeks � he was also 2nd to Ott DeFoe in the Bassmaster Classic on the Tennessee River. It was the second tour-level win for Powroznik, who earned $100,000. He won a Bassmaster Elite Series event at Toledo Bend Reservoir in 2014. "This one feels about the same," he said. "I'm still fishing against the same guys and they're the absolute best. When you beat them, you've done something. It's not an easy task." Powroznik, who made long pitches with a weightless V&M Chopstick on spinning gear to shallow bulrushes in the creek arms, trailed the frog-wielding Wheeler by 9-11 entering the final period. Wheeler had amassed 35-02 in the second stanza, closing it with an 8-05 monster that was the biggest fish weighed on the day. Wheeler followed up with a solid 19-07 in the final period, but the last 2 1/2 hours belonged to Powroznik. The Virginian boated 32-12 on nine fish, including a 4-pounder and a 6 1/4 with a little less than an hour to go that put him on top of the standings. The closing minutes were a three-way affair, with 3rd-place finisher Takahiro Omori (19 fish for 52-11 on the day) also in the mix. However, none of the trio connected over the final 13 minutes. Both Powroznik and Wheeler changed locations in that timespan, with Wheeler making multiple short moves before time ran out. "Just the emotions in this format � wow!" Powroznik said a few minutes after trailering his boat. "I absolutely love it. All the emotions and feelings; the ups and downs and highs and lows. It keeps you rolling the whole time." Jacob Wheeler's second-period heroics weren't quite enough to hold off Powroznik. Angler of the Year points leader Edwin Evers, who topped the standings after the opening period, ended up 4th with 43-13 on 15 fish. He was followed by Mark Daniels Jr. (9, 30-13), Classic champion Ott DeFoe (7, 26-01), Jeff Sprague (8, 25-14), Alton Jones (8, 21-08), Jared Lintner (5, 13-08) and Russ Lane (4, 11-13). Sprague, who joined Evers as the only anglers to make the Championship Round in all three BPT events to date, is now 2nd on the points list. Powroznik said he was thankful that the sky was cloudy throughout the day. If it had been sunny, he would've been tempted to sight-fish all day and figures he would've ended up spooking a lot of fish with his boat in the extremely shallow water. He did look at a couple and hooked one in the 5- to 6-pound class, but it came off before it got to his boat. "They were sitting on anything that stuck out a little farther off the bank than anything else," he said. "The fish were closer to the mouths of the pockets than they were to the backs. What kept me going was I couldn't see them and I just had to fish for them." He doesn't think his prior experience on the lake � the most recent of which was 6 or 7 years ago � was a big benefit in the Championship Round. "You can put your boat in and see what they live on. The biggest thing was this morning when the first one chased that floating worm out and I said, 'Okay, there they are.' That was the whole key to what I did." Wheeler wasn't too bummed about his second straight 2nd-place showing. "That's the way it goes � you win some and you lose some," he said. "I'm making good decisions and I'm fishing clean. I've been on both the giving and the receiving ends of these things. I'm putting myself right there and that's all I can ask for. "It's a little disappointing to not win, but it was still an unbelievable day. This is my job and I love what I do and I'm going to enjoy the heck out of it. I'm not going to be crying 'Whoa is me' after I just made $42,000." He was the only final-day competitor to throw a frog. He went into the day convinced that a surface offering would be his best bet. "I just figured it could be a deal because we'd had two warm nights in a row and this is a power-plant lake, so the fish were probably further along (than they'd been in Falls and Jordan lakes, which hosted earlier competition rounds). I had five topwaters rigged up, then I got my first bite and it was a 4-02, so I said I'll just roll with this." A storm front came through the Raleigh area in the early afternoon, but he doesn't believe that was the reason his action was slower in the third period than it'd been in the second. "I had three bites and lost a couple right after that, so I don't think that was it. There were a lot of locals fishing every pocket, so I couldn't run the obvious stuff just because it had gotten so much pressure." Omori threw a spinnerbait for the first hour and also tried some flipping early in the day with no success. He began racking up numbers after he tied on a Z-Man ChatterBait tipped with the same company's Razor RaZor ShadZ. "I feel really good about my finish because this place was unknown for me, like it was for most of the guys," he said. "I didn't know what to expect, so it's good. "When you got in an area where the fish were grouped up and aggressive, you could catch quite a few."